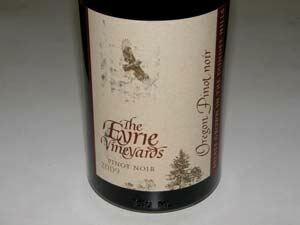 There are many Pinot riches to be found in the age worthy 2008 vintage and the precocious 2009 vintage from Oregon. I have had some spectacular wines recently, all of which are currently available from the respective wineries or easily obtainable in the retail marketplace. Partners Ernie Pink and Dena Drews bought a cherry orchard 15 miles southwest of Salem, Oregon, and began converting the property to a vineyard in 1999. The couple were Pacific Northwest computer geeks who had no background in the wine business, but learned winemaking and viticulture through local community college courses. The 30-acre dry-farmed vineyard is planted primarily to eleven clones of Pinot Noir, with lesser amounts of Pinot Meunier, Syrah, Chardonnay and Viognier. Elevation ranges from 275 to 650 feet and the soils are welldrained Bellpine series. 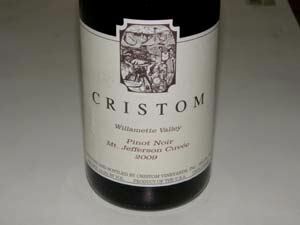 The first vintage in 2002 was sold to several notable Willamette Valley wineries (including Beaux Freres and Cristom). By 2006, a gravity-flow winery was completed and the owners had bottled their first vintage under the Amalie Robert label. The name is a combination of the proprietors middle names: “Amalie” (AIM-a-lee) is Dena’s and “Robert” is Ernie’s. Their rapid ascent into the upper echelon of Oregon Pinot Noir producers has been remarkable, and this year the winery is one of a group of forty-two select Oregon wineries participating in The Vintner’s Circle at the ¡Salud! Oregon Wine Auction. The winery was a chosen participant in this year’s International Pinot Noir Celebration and was selected by Wine & Spirits as a 2011 Winery of the Year. With only three vintages of Pinot Noir in the marketplace, that is quite an accomplishment! Amalie Robert Estate wines are sold through the winery’s online store. Magnums of some wines are offered by request. Tasting is by appointment. Visit the interesting and somewhat quirky website and read about how the proprietors found their Pinot Noir groove (hint: it involved a magnum of Domaine Dujac drank with a meal in Paris). Mailing list members receive a yearly Julian Calendar to track the growing season. This monthly update includes both a photo journal and farming humor and I find it thoroughly captivating. 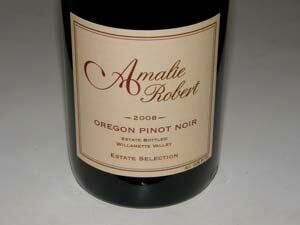 I recently sampled the lineup of 2008 Amalie Robert Estate Pinot Noirs and a 2009 Amalie Robert Estate Chardonnay. This was my first exposure to this winery and I considered the wines well-crafted with admirable balance and charm. The Pinot Noirs are fermented with whole clusters and indigenous yeast. All Pinot Noirs are aged a minimum of 12 months in French oak barrels. The lineup of wines is based on barrel selections. The two partners independently select their favorite barrel for The Reserve (not tasted here). They then choose the “Hers” and “His” reserves: Amalie’s Cuvée and Estate Selection. About 10 to 15 barrels are selected that represent their individual palates. The Vintage Debut is the first Pinot Noir release from the vintage, reflecting the broadest interpretation of the vineyard terroir and crafted for early drink ability. The Wadenswil Clone and Dijon Clones bottlings speak for themselves. Both a stainless steel fermented Chardonnay (Her Silhouette) and barrel fermented Chardonnay (Heirloom Cameo) are offered. 13.4% alc., $30. · Moderate reddish-purple color in the glass. Nicely perfumed with vivid aromas of black cherries, spicy stem, and new oak. 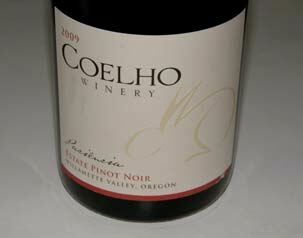 Light to medium weight flavors of black cherries and red berries with complimentary oak. Supple tannins and brisk acidity on the finish. Nicely put together and very approachable now. I like it for its easy drinkability. Drink this one while you cellar the other 2008 Amalie Estate Pinot Noirs. Fine the next day from a previously opened and recorked bottle indicating it will hold up nicely over the next few years. Very good. 13.8% alc., $50. · Moderate reddish-purple color in the glass. Complex nose offering aromas of cherries, strawberries, sandalwood, wine cellar, balsam and a little barnyard. The pleasing core of fresh cherries makes quite an impression on the mid-palate and persists on the long finish that is marked by sharp citrus-driven acidity. Flavors of new oak and tobacco ply the background. An elegant, vibrant and minerally wine that is ready to drink now. Good (+). 13.8% alc., $50. · Moderate reddish-purple hue in the glass. Subdued but pleasant aromas of mixed berries and black cherries with a violet note. Silky and earth-driven flavors of darker red berries and subtle baking spice, wrapped in supple tannins with oak playing a complimentary role in the background. A classy wine with very impressive persistence on the aromatic finish. 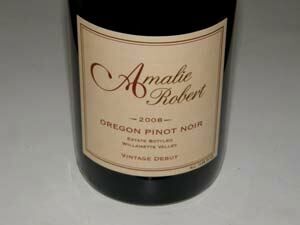 The most cellaring potential of the 2008 Amalie Robert Pinot Noirs and the one with the most Pinot charm. 13.4% alc., 192 cases, $40. Dijon clones 777 (72%), 115 (23%) and 667 (5%) grown on 3 different rootstocks sourced from 5 dry-farmed blocks. · Medium reddish-purple hue in the glass. A chameleon in the glass with mellow aromas that come and go including cherries, strawberries, brier, herbs and spice. Simple and direct, medium-bodied essence of cherries and cherry skins on the palate, finishing on a cherry and citrus high note. A pretty wine that aims to please. Very good. 13.8% alc., 50 cases, $50. · Moderate reddish-purple color in the glass. Complex scents of black cherries, blackberries, sassafras, prickly pear and oak vanillin. Darkly fruited and savory, mysterious and primal, offering flavors of black currants, blackberries and brown spices enrobed in dusty, fine-grain tannins. More intrigue and structure and less acidity than the Dijon Clones bottling. A good cellar candidate. Very good (+). 14.5% alc., 80 cases, $50. Two-thirds Dijon clone 76 and one-third Dijon clone 95. I haven’t tasted many Oregon Chardonnays, but I do taste quite a few California Chardonnays, and this wine made quite an impression on me. If this wine is indicative of Oregon’s potential for Chardonnay, more Oregon wineries should feature this varietal. Although I enjoy Pinot Gris for what it is and understand it is Oregon’s signature white wine, Chardonnay can potentially offer more sophisticated drinking. · Light straw color and clear in the glass. Enticing aromas of white peaches, lemon curd, white pears and buttery oak. Delicious and juicy array of white peach, Asian pear, baked apple and pineapple flavors, honed with just the right amount of mineral-driven acidity for brightness, and offering a silky mouth feel that excites the senses. 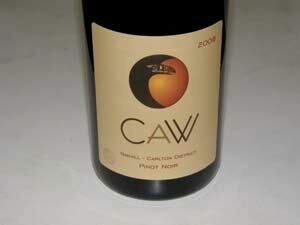 A classic, and maybe the best Oregon Chardonnay I have ever had. This iconic producer needs no introduction. Véronique Drouhin-Boss has crafted the wines here in every vintage beginning in 1988. 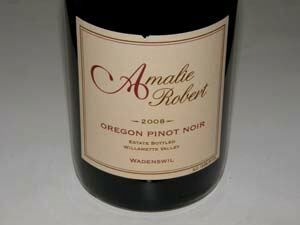 The Pinot Noirs show more elegance and less power than many Oregon Pinot Noirs, and they age extremely well. I have had a couple bottles of the 1992 vintage within the last two years, and the wines are still remarkably fresh. 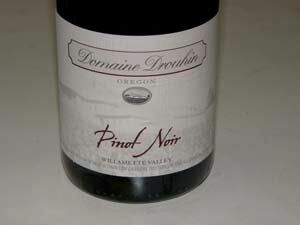 If you had to choose just one Oregon Pinot Noir producer that represents the Oregon style and differentiates it from the typical California style, Domaine Drouhin Oregon would be a perfect choice. Three Pinot Noirs are produced from the 90 acres of densely planted estate Pinot Noir: Classique Willamette Valley blend (contains some sourced grapes), and Laurène and Louise vinfied solely from estate grapes. The wines are sold in the tasting room in the Dundee Hills, on the website, through a mailing list, and via retail channels. 14.1% alc., $40. · Light reddish-purple color the glass. Classic Dundee Hills perfume of red cherries, strawberries, sandalwood and a hint of spice holding up nicely over extended time in the glass. Moderately intense flavors that echo the nose make an impression on the mid-palate, complimented with an underpinning of faintest oak, and ending with a very long cherry-driven finish. 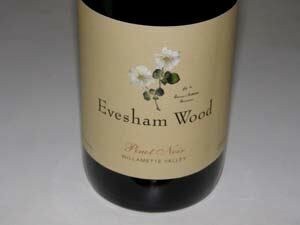 Not as big and splashy as many 2009 Oregon Pinot Noirs, but a very charming example of power with finesse. Very approachable now but has the balance to last 10 to 15 years. Very good (+). 13.9% alc., $65. A finest lots selection named after Véronique’s elder daughter and first produced in 1992. Available in magnum ($150) and Jeroboam ($325) formats. · Moderately light reddish-purple color in the glass. The fruit aromas have not completely arrived in the wine, so the scent of dark red cherries and berries is overshadowed by oak. Bright and lively flavors of black cherries, black raspberries, cola, and sassafras led by oak undertones that are prominent at this immature stage. A serious, polished wine that is moderately intense and structured, yet displaying an admirable elegance, and finishing like a three hour movie you don’t want to end. You could drink a bottle now, but it would be a crime as the wine needs several years to emerge and shed its oak wrap. 13.5% alc., $17, screw cap. A large production blend that is consistently dependable. · Moderately light reddish-purple color in the glass. Aromas of cherry pie, spice, vanilla and seasoned oak. Crisp cherry flavor in a straightforward, lighter style with well honed structural tannins and bright acidity. Soft in the mouth with admirable finesse, finishing with a mild herbal oak note. Good. 13.4% alc., 329 cases, $36. Coats and Whitney Vineyard is a sustainably farmed, 10-acre site midway between the townships of Carlton and Yamhill that was established in 2004. There are 7.5 acres planted to Pinot Noir (75% Pommard and 25% Wädenswil). Soils are quick draining Willakenzie. Second vintage of this wine. 100% de-stemmed, 5 day cold soak, aged in 25% new French oak barrels. · Moderate reddish-purple robe in the glass. Welcoming aromas of black cherries, strawberry jam, violets and sweet oak. Medium-bodied flavors of nicely spiced cherries, raspberries and plums with a floral note persisting on the finish. Very smooth and charming in the mouth with well proportioned tannins and overall impeccable balance. Very good. 14.2% alc., $27. 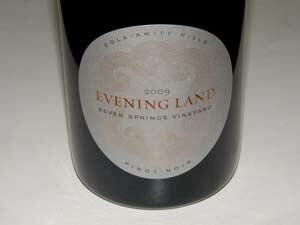 Winemaker Steve Doerner is a master blender and this blend is always a dependable wine. Native yeasts, minimal handling, unfiltered. Always the first Cristom released each vintage, it is an early drinking wine of great value (often found discounted below the retail price). · Moderate reddish-purple color in the glass. Plenty of whole cluster spice on the nose highlighting the strawberry and cherry fruit aromas. Discreetly concentrated flavors of darker red berries accented by hints of anise, earth, chocolate and oak. Juicy and crisp with some firm, dry tannins. Very approachable now, but will benefit from another year in bottle to soften the tannins and boost the charm. Very good. 13.0% alc., pH 3.90, TA 0.51, 525 cases, $40. Clones are Pommard and Dijon 777. Native yeast, aged in 20% new French oak barrels sur lie for 10 months. · Moderate reddish-purple color in the glass. Bombastic aromas of black cherries, spice, seasoned oak, brier and rose petal. Stunning black cherry and black raspberry liquor-like flavor. Palate-staining, yet discreetly concentrated and light on its feet, finishing with large scale fruit flavors that last for a minute. Hints of allspice, oak and tar in the background. Still great the next day from a previously opened and re-corked bottle. An instant festive occasion. 14.1% alc., 1,881 cases, $38. From the De Ponte estate vineyard. French oak aged for 12 months in 20% new and 80% 2 to 5 year-old barrels. · Moderately light reddish-purple color in the glass. Full-on perfume of fresh boysenberries, potpourri, incense, and Moroccan spices. Lip smacking black cherry and boysenberry essence with subtle oak, musk and spice undertones. Everything you want in a Pinot Noir: mouthwatering attack, bright acidity, ripe tannins, a lingering finish and impeccable balance. A stylish and sensual pleasure. 13.75% alc., pH 3.56, TA 0.54, 1,528 cases, $40. Own-rooted Pommard with some 114, 115 and 777. Planted in 1984, 1988, and 1993 to 1996. Volcanic basalt soils of the Jory series. 100% de-stemmed, indigenous fermentation, aged 12 months in 25% new French oak barrels. Bottled unfined and unfiltered. Winemaker is Isabelle Meunier and consulting winemaker is Dominique Lafon. · Moderate reddish-purple hue in the glass. Muted aromatically and slightly reduced initially, offering over time aromas of black cherries, smoky oak and humus. Medium-weighted mix of dark red and black berry and black cherry fruits backed by moderate grainy tannins, finishing with a spiced fruit, oak-marked finish. I rechecked the wine from a previously opened and re-corked the next day and two days later, and the wine become much more expressive over time, with brighter fruit aromas and flavors while still retaining a noticeable oak underpinning. Great potential here, but the wine needs more time in bottle. Very good. 13.8% alc., 1,000 cases, $40, Vino-Seal. 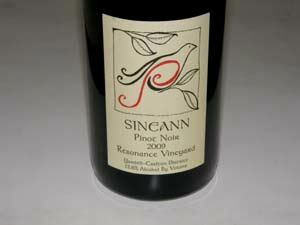 Sineann’s best Pinot Noir each year. The vineyard is meticulously farmed by Kevin and Carla chambers using biodynamic techniques. Yields are about two tons per acre. Pommard and Wädenswil clones. · Moderate reddish-purple color in the glass. The nose is floral and savory rather than fruity initially with black cherry aromas gradually emerging over time in the glass. Dark berries, black cherries and Damson plums are featured with a slight hint of tarry oak. Soft in the mouth, becoming more expressive over time in the glass. Mildly muscular tannins with a dry, berry jam finish. Much better the following day from a previously opened and re-corked bottle. Resist the urge to open it now. Love the glass closure. Very good (+). 13.5% alc., $35. · Moderately light reddish-purple color in the glass. Demure aromas of fresh cherries, herbs and rose petals. Soft and delicate in the mouth with charming red cherry fruit flavor, finishing long and dry with a slight cut of citrus and a riff of herbs accenting the red fruits. A reserved and elegant offering in the classic Pinot Noir mold that is easy to embrace. Very pinotesque. 13.8% alc., $24. · Very appealing nose displaying aromas of fresh cherries, black raspberries, spice and subtle oak. A lighter-weighted style with charming cherry fruit, picking up intensity over time in the glass. Still a bit tight, with tannins mildly secluding the fruit flavors and the nose currently trumping the palate. Needs another 6 to 12 months in bottle. Good (+). 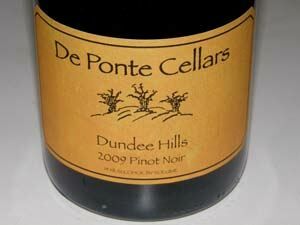 Good Pinot for a Ten Spot?